Here is yet another installment of the wonderful letters the campers of Jewell sent us. Charlie came back and visited us during our voulunteer work weekend and had a blast. I would like to thank you for allowing me to go to overnight camp first session and Ranch Camp for fourth session. It meant so much to me! I was so happy & proud when I saw the new baby foal. I feel bad for it, though, because Julia wants to name it “Ducky” because it’s mothers name is Birdie. HAHA! 🙂 I had so many new experiences! I learned so much about horses, passed my Colt neckercheif and had loads of fun! Fourth session was awesome! I hope I would be able to go again next year. Feeding was crazy though. I remember Mable spooked herself with her own fart, pulled, and she broke free with the wood dangling off her muzzle, still haltered! It was chaos! But now it just seems funny. I had a blast! I met so many great friends! Thanks again! There was a woman that down to Wilson-gray and was inquiring about seeing our facility, so one of our leadership staff helped in assisting her with that. Once the tour was complete, the woman left. Two weeks later the same woman returned, but this time for something else. She explained “I have never entered a facility where all the staff greets me with a smile and their blue YMCA shirts were all around. I have never experienced every director who I encountered take the time out to get to know my name. Every child was engaged with staff, and every member was surrounded by a staff. An I have never experienced so many staff helping one another”. After this conversation the woman made this ending statement, “because of all of this, I want to be apart of a facility like this”. Now Margaret is a part-time staff working in our Welcome Center. From this encounter ms Valencia Membership Director says every effort that is made is never to little. This story is the reason ms Valencia keep her going. If you get a chance come on down and get the wonderful experience of the Wilson-Gray Y.M.C.A… WE WILL BE HAPPY TO SEE YOU. It was about 6:00 PM and I was on my way home on Wednesday night. I got a call from the Y (I just love those calls). The Teen Center staff had an emergency and needed someone to cover. It was too late to start making calls from my car so I got off the highway and turned the car around and headed back to the Y. My next call was home to my wife and three boys… I do not love making this call but my wife always tells me to be safe (I will leave out the other stuff she tells me :)). I got to the Y and we had martial arts going on in the gym, two families signing up for camp, and a group of teens playing in the gym. Just awesome! The very second I came through the door one of the kids in the Teen Center came right out and send “Mr. Mike I bet I can beat you at pool”. Challenge accepted. The rest of the kids crowded around the pool table to taunt and distract me….but it didn’t matter since I am a terrible pool player. I am not hip with any kind of lingo but it made me feel really good. I was in my car on the way home and thought about how I was just given the chance to be the “Caring adult in the presence of every child”. Turning the car around is never a hard choice to make- the lives we can touch makes it all worthwhile. In one of my daily walk throughs of the wellness center I stopped to offer encouragement to a group of ladies who are participating in small group personal training. Through my conversation with them, they invited me to join their work-out group the following week. I graciously accepted. It was by far one of the best hours that I have spent with members to date. On the day that I joined them it was the last day of a six week series of personal training for them. Tim, the trainer, had planned a little more than a one mile run around Bushnell Park. It was the classic pre-test and post test scenario, so they could gauge how far they have come with PT in the past six weeks. Sidebar: I am not a fan of running, I would rather ride my bike 20 miles than run 1. So I put on my game face and embraced the beautiful afternoon and set out for my run with the crew. As we approached the park, Jan, a YMCA member, told me that she had never run before training with Tim. She had never run on a treadmill and Tim had her doing sprints in the end. And this mile that we were about to embark on would be her very first mile ever to run. We placed on toes on the starting line and on Tim’s go Eileen took off running. Nancy, Jan and I ran together for the first 1/2 mile. At the second half mile we all found are own pace. Eileen, finished first, I took a distant second, Nancy was a minute behind me. And then Jan crossed the finish line. We all high-fived her, gave her big hugs. You would have thought that she just finished the Hartford Marathon with the amount of cheering that the 5 of us created. She was grinning ear to ear. She was proud of what she accomplished. It was a great moment and I was blessed to be a part of it. I will always remember Jan’s first mile. Were there other things that I needed to attend to during that hour on a Tuesday afternoon. Yes. There were emails to respond to, phone calls to return, budgets to review and a hundred other things in my “in box”. None of the above would have had a greater impact on relationship building than a one mile run around the park. In our work, we should make every attempt to not let the day to day, take precedence over relationship building. It is not only good for our members and but it refuels our own spirit. It reaffirms why we have chosen the YMCA as a career. I love my job for this very reason. The reminder popped up yesterday at about Noon – ding! Yes, Erica, there IS a Trendsetters meeting tomorrow at 11am in East Hartford. “UGGGGGGHHHHHHH”………..I have so many pledges to enter, I have deposits to reconcile, I have a camping display to set up, I have stewardship letters to generate…the list goes on. “I’m sure Chris could email any pertinent information I may miss…” I thought about it for a few minutes, then heaved a sigh as the angel on my shoulder whispered to me in quite a puchy manner. I rearranged a few things on my schedule, checked with Kaitlin, a fellow Trendsetter, to ensure her attendance, and resigned myself to schlepping out there with a heavy heart. Honesty is not only an extremely fine trait to possess, but it is, in fact, one of the YMCA’s four core values. Today I realized that we’re not always the pillars of honesty that we profess to be – especially in the face of potential ridicule. I’m guilty of it myself – upon hearing great sighs from colleagues after announcing that yes, we were in fact going to do another Big Picture Deck activity, I’ve actually changed my tune and muttered something to the effect of “yeah, I know, but we’re SUPPOSED to.” That stops today. Chris Pallatto has often remarked that this project is not reinventing anything; it’s not turning anything upside down. Living Our Cause and being a Trendsetter Y is only meant to enhance, celebrate, share, and communicate the work we are already doing. That doesn’t sound so bad, does it? Today’s Trendsetter epiphany has me reinvigorated, excited, and ready to share with my team. I will approach it with enthusiasm, and will make certain that I continue to remind myself that this is very important work that impact the quality of life for others. And I won’t forget it in three hours. Honest. Collaboration comes in many shapes and sizes. It can be between members, between the YMCA and other non-profits, or it could take place on the gym floor with youth basketball players. It’s an important way for us to strengthen community. In fact, it’s so important, there’s a “toolkit” from the YMCA of the USA which helps us understand the value of collaboration. Our very own Shelly Garrow, from the West Hartford/Tri Town YMCA, presented an activity from the toolkit today to our Living our Cause learning team. She added a very creative and musical twist that made for great conversation and fun. 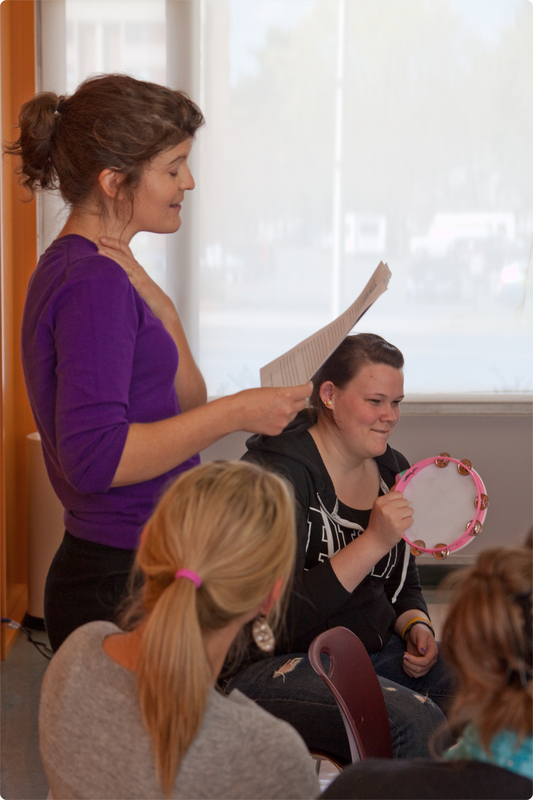 Every time she mentioned a collaborative effort from the story she was reading, you had to shake your tamborine. Good times and we were all listening intently for signs of collaboration (which are every where at a YMCA). We have many families who have started coming to our facility recently with children who have special needs (mostly Autism or Downs Syndrome). We have learned that our community lacks programs that are accessible for children with special needs, simply because many facilities are not trained and/or equiped to work with special needs children, specifically those with significant limitations. So, we created an adaptive aquatics program, Aqua Buddies, so that they can come and learn to swim in a safe, quiet environment. The class is led by two specially trained instructors as well as volunteers who will be starting in the next couple of weeks. Monday was our first day of class so I wanted to take the time to meet the parents and children enrolled in our program. After returning voicemails, I stepped onto the pool deck to see how things were going. First, I met a mom that I had spoken to on the phone at least a dozen times in the previous two weeks. She told me how thrilled she was to have this program and how her son, Griffin, was responding extremely well with his instructor (Bonnie). After our conversation, I observed the class a little longer and took some mental notes about things that we should try for next week. I was about to walk away when I noticed the interaction between another boy in the class and the instructor (Ed) who was working with him. The boy’s name is Vincent; he just turned 10 years old and is non-verbal Autistic. Ed and Vincent swam back and forth a few times so when it was time for rest, Ed helped him climb up and sit on the edge of the pool. Ed was teaching Vincent a cue to enter the water when it was safe to do so. He wanted to be sure to make eye contact with Vincent and get a high-five so that they could swim again. For those of you who don’t know, Individuals with Autism struggle with social skills such as making eye contact so this was not an easy task for Ed. He succeeded and even managed to get a slight smile from Vincent! Watching the interaction and seeing how patient and good Ed is with Vincent literally brought tears to my eyes. Ed is our swim coach and when he heard that we were offering this program, he asked me if he could help since he works with Autistic children full-time outside of the Y. To say that I was impressed is an understatement. I am truly touched and humbled by the way Ed is so clearly passionate about helping Vincent. I knew that by offering this class we would have the opportunity to touch lives of children that we have not reached out to before. However, after witnessing the care and respect that Ed showed to Vincent, I was moved. I never imagined that this class would have had that impact on me the way that it did. I am so grateful to have witnessed that moment…. Wilson Gray Y.M.C.A Likes To move!!! After 2.5 hours of this heavy material, Karen shared a journal entry from Cory, one of our survivors in our current group. “‘FAITH is the key to happiness, HOPE is the promise of tomorrow, LOVE is the joy of life…’ I sit here looking at a picture frame that says this, with pictures of my friends and family surrounding me at a benefit thrown to help me through a very difficult time in my life. I find myself waking up each day thanking everyone who has helped and supported me through my journey. Each day, my list of people to thank grows. I was so happy to be asked to be a part of the LIVESTRONG YMCA program! And now I thank my trainers and everyone that I have met at the YMCA because of this wonderful program. It gives me physical and emotional strength in a time when I really need it. My family has battled alcoholism and M.S. and when I battled cancer, we all pulled together to make our family bond much stronger, with our ‘one day at a time’ and ‘life is good’ attitudes. The people I have met in this program have been an inspiration to me too. There is so much strength to be ssen from them, it touches my heart. I am truly proud to call myself a survivor, and to be surrounded by so many survivors is truly an honor. I will share a reading that I shared with my group. ‘Sometimes life will kick you around, but sooner or later, you realize you’re not just a SURVIVOR, you’re a WARRIOR, and you’re stronger than anything life throws your way!’ – Brooke Davis. Thank you YMCA, for helping us become WARRIORS!